Step inside the fabulous Washington Square Manor, and you will be instantly transported to a simpler time and place… 1899 Savannah to be exact. This luxury vacation rental has four bedrooms and is ideally situated directly on Washington Square, considered by many to be Savannah's most beautiful residential square. Washington Square was originally laid out in 1790 with homes dating back to 1797 in the colonial style which was typical of Savannah homes built 200 years ago. The Washington Square Manor was built in 1899 and is one of the “newest” homes on the square. It was built in the classic Queen Anne Victorian style of the period. Washington Square was named in honor of George Washington, Revolutionary War general and first president of the United States. President Washington visited Savannah in 1791 and stayed at a home a few blocks over on St. James Square (now Telfair Square). Washington Square is your picturesque front yard and features slate walkways bordered with native shrubs and a colorful array of flowering plants underneath a canopy of moss-draped old live oaks. The square is one of Savannah’s most popular spots for outdoor weddings year-round. On most weekends, it is fairly common to see brides being delivered to the square by horse drawn carriages. • The Brice Hotel (1/2 block east) – Savannah’s all-new upscale, boutique hotel with 145 guest rooms! • Leopold's Ice Cream (5 blocks southwest) – Voted Best Ice Cream in Savannah! • The Olde Pink House Restaurant (4 blocks west) – Reservations recommended. The home has a historic Savannah floor plan with a side-hall entrance and includes many original features such as plaster ceiling medallions in the living room and dining room, antique heart-pine floors, and plaster walls. The parlor has stunning views of the square and a gorgeous chandelier. The dining room has the companion chandelier and a large dining table for eight. The kitchen features a cozy seating area with one of the five HDTV’s found in the home. The kitchen includes a gas range, microwave, dishwasher, refrigerator, and double sink as well as granite countertops. 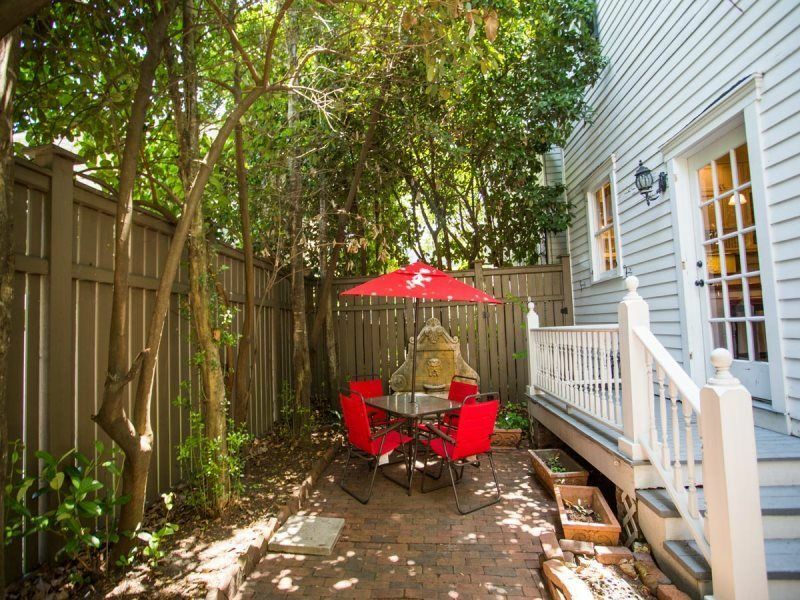 In the rear, a charming brick courtyard awaits you and is ideal for your morning coffee or simply relaxing after a long day of Savannah sight-seeing. The upstairs contains the master bedroom ensuite which overlooks Washington Square and has a balcony that runs the width of the home. The two additional bedrooms have access to a separate full bath with vintage fixtures. A permanent staircase to the third floor attic allows access to the fourth bedroom with a full bed and twin bed. The home sleeps up to nine guests comfortably. There is a dedicated laundry room on the first floor, as well as a quaint powder room tucked under the main staircase. The ceilings throughout the house are high with crown molding in most rooms. There are five fireplaces with original Victorian period mantles. This beautiful century home offers everything you could ever want in a luxury Historic Savannah rental combined with the perfect location. Live like a true Savannah native… If only for a short while! Southern Belle Vacation Rentals is a full service vacation rental company dedicated to providing clients with great places to stay and friendly and helpful service. We’re here to help and give advice on just about anything you will need to know about your trip. Southern Belle Rentals has developed a strong reputation for listening to our customers and exceeding their expectations again and again. If you’re traveling on business or pleasure and have a special request, feel free to ask. We will do our best to make it happen for you. Traveling can be stressful and tiring. The goal of Southern Belle Rentals is to make your trip as perfect as possible. You will find your vacation rental home stocked with just about everything you will need to get your vacation started. Bring a suitcase and a smile and let us do the rest. Perfect location in Historic Savannah! We had a total of 8 in our group staying in the Washington Square Manor. The home was spacious and beautifully decorated. There was ample room for everyone to relax during our down time. We utilized the kitchen the whole stay ( I especially liked the garbage disposal!) The backyard was great for the smokers in our group to utilize. The best feature of this rental is the great location, within walking distance of most everything. The staff was very helpful and even called to check in with me to make sure everything was ok. We will definitely recommend Southern Belle Rentals and use them again the next time we plan a trip to beautiful Savannah! Rates do not include taxes, fees, and cleaning. Some dates may be higher, including holidays. Some date may require longer stays.